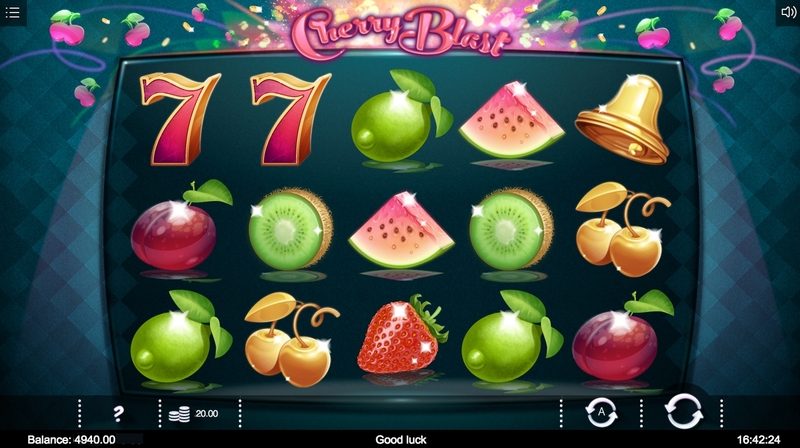 Cherry Blast slot combines the graphics and style of a video slot with the gameplay and look of an AWP fruit machine. This style of game has been pretty successful for Novomatic with their slots Power Stars and Xtra Hot, so can game maker Iron Dog make a hit with their adapted game. Cherry Blast has a total of 5 reels, with 3 rows and 20 paylines in total. The reels are literally covered in fruit, with gold bells, 7’s and gold cherries making up the remaining standard symbols. As you would expect with an AWP-style game, there are plenty of winning opportunities in the base game, with 1000 coins awarded for 5-of-a-kind (5OAK) gold cherries. This drops down all the way to 30 coins for a 5OAK for the Kiwi Fruit. If you land a bomb symbol in the middle position on the middle reel then you will reveal either 3 scatters, Free Spins symbols, Bonus symbols or up to 5 Wilds. Because of its position, this can work out quite nicely. Should 3 appear you will be awarded a cash prize of 80 coins. Cherry Blast comes with a free spins feature, which is triggered by 3 free spins symbols. You will be awarded 100 coins initially and 9 free spins. There is a special cheery bomb symbol in the feature which can create Super Wilds or Super Scatters for extra winning opportunities. If the bomb triggers 3 bonus symbols then you will get a special Dash bonus, which looks remarkably similar to Pac Man. You select from the 5 routes available, with higher numbers offering bigger rewards, but more risk. 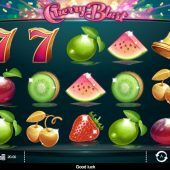 For the style of game Cherry Blast is, a mash up of AWP fruit machine and video slot, then this game is absolutely packed with action. There are bombs going off and an array of features available. You will not get bored easily with this one. There is a very reasonable 96% RTP, which is very typical for Iron Dog and plenty of rewards in the base game. I tend to prefer some of their other slots, such as Blood Queen and Neon Jungle, but this is still a very entertaining game. Its fun, its fruity, Cherry Blast is definitely worth a look.